Soaking and Poking - between inside and outside. August 18th was the deadline issued by the Taiwan Rural Front (台灣農村陣線/TRF) for an official government response to the Dapu Borough forced demolition last month. Predictably, the only responses from the current administration were statements critical of the methods of protest in the past month (Egg and paint throwing, placing the "Yesterday Dapu, Today the government (今天拆大埔, 明天拆政府)" stickers on public gates and walls, and spray painting the sidewalks and public facilities) and the extent to which government buildings need better security. Aside from the series of small protests through the month of July and August, the Taiwan Rural Front also planned two large-scale protests, one in Miaoli County (right in front of the Miaoli County government's building) and one in Ketagalan Boulevard. I wasn't able to attend the music event/funeral for County Commissioner Liu Cheng-hung last Friday. From the videos from reporters who were at the scene, the event looked like a success. It was one of the biggest anti-establishment rallies in Miaoli's history, drawing more than one thousand participants. I arrived the "Return the Country the People - the 818 Tearing down the Government Movement (把國家還給人民, 818拆政府行動)" on Ketagalan Boulevard about an hour before the event. There were already a lot of volunteers there, setting up chairs, the stage and booths. I observed a death shrine for Miaoli County Commissioner Liu Cheng-hung (劉政鴻) and a huge bag of cow manure. It's not difficult to imagine what some of the participants did to the shrine with the cow manure. Law enforcement already put up double barricades in front of the President's Office. Buses full of police officers were resting and getting ready behind the barricades. It felt as if the government was preparing for some kind of violent riot to break out at any second. The rally was peaceful with an estimated 20,000 participants, larger than the organizer expected. Although the number of participants were much smaller than the "Justice for Corporal Hung" rally a few weeks ago, the energy, compassion and excitement of the crowd was much more evident. Peter Huang (黃文雄), the failed assassin of Chiang Ching-Kuo (蔣經國) in New York (1970) and Yang Ru-men (楊儒門), the Rice Bomber were both there. Huang incredibly gave a moving speech on non-violent methods of protest and shared his story as a fugitive and an exile. Members of the arts, music and film industry were present as well. 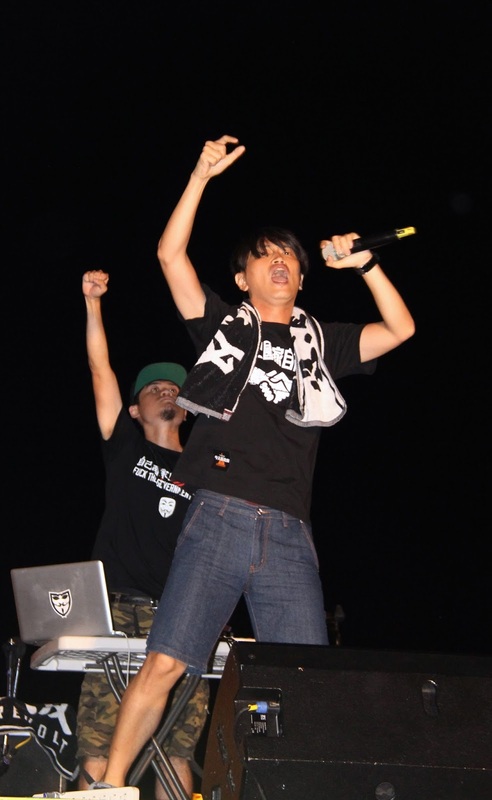 Hip hop band, Kou Chou Ching (拷秋勤) rocked the boulevard with their famous rap song, "Civil Revolt (官逼民反)". Director Ko I-chen (柯一正) and Wang Shau-di (王小隸) went on stage to sing "Do you hear the People Sing?" with a group of Anti-Nuclear Power advocates. Director Wang's presence was especially significant, as she was the daughter of National Chinese Party (KMT) military strongman and mainlander, Wang Sheng (王昇). What was surprising to me were the number of self-help groups there were. One after another, members of the self-help groups went on stage to testify in front of rally participants their stories of land grabbing. The speeches were emotionally, especially coming from elderly farmers, who has been farming on their land for decades and then were driven out by the government in the name of "progress", "development" and "modernity". It was also surprising to find the majority of self-help groups came from Miaoli County. As the rally came to an end, host and mistress of ceremony, Professor Frida Tsai, asked the participants to march down Zhongshan South Road and relocate to the Executive Yuan for an overnight sit-in. I moved ahead of the marchers to get a better view of the crowd and to take some photographs. At that time, I couldn't help but wonder, how the TRF could symbolically "tear down the government", when there were already hundred of police officers waiting for them in front of the Executive Yuan? The marchers approached Xuzhou Road (徐州路), and a political science student from the National Taiwan University (NTU) and member of the Taiwan Rural Front asked the crowd to stop moving forward to wait for the rest of the group. From the changing mood and energy in the air, I realized something was about to go down. I looked toward my right at the Ministry of Interior, there were only a hand full of police officers guarding the gate. Then, it happened. 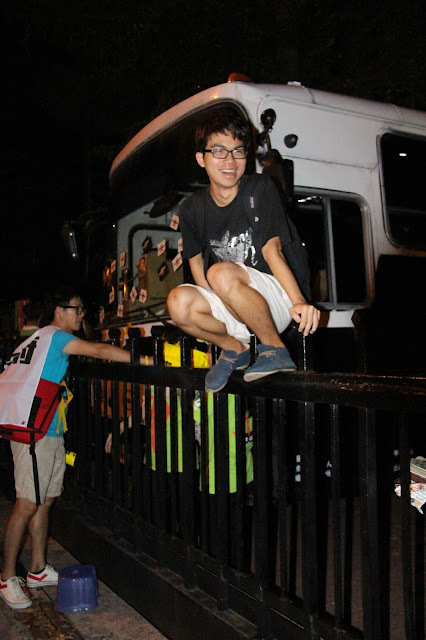 The students started running toward the Ministry of Interior and began climbing over the fence. Some students put the large blanket they brought with them over the blade wires and pulled them away from the gate so others could climb in. Soon, the court yard of the Ministry was filled with young people. In all, approximately 2,000 rally participants stormed the Ministry of Interior and took the government building over. Law enforcement attempted to stop the crowd on couple of occasions but decided to retreat as the officers were outnumbered. Both gates to the Ministry were now wide-open with protesters continued to move in. The organizer was also able to drive their "battle truck" in to the courtyard of the Ministry as well. Incredibly, the students sat in front of the building as the organizers requested. A few eggs were thrown but the behavior was immediately stopped by the organizer. No windows were broken, the gates were intact and no one entered the building to cause any damage to the offices. The protesters put stickers on the windows and doors to the Ministry and tied the doors together. Then, quite a few very talented students began painting and spraying the ground in front of the Ministry. Soon, a ground painting was completed. It tells the story of a monster swallowing the people's land, taking their lands and making them cry. Professor Hsu Shih-jung (徐世榮), President of the Taiwan Rural Front, Ms. Peng Shiu-tsun (彭秀春) one of the victims of the forced demolition and Professor Liao Pen-chuan of the National Taipei University sat on the front line. The protesters continued to occupy the Ministry of Interior until six o'clock in the evening on the next day. Deputy Minister of Interior Hsiao Chia-chi (蕭家淇) tried to convince the protesters to leave at one point; however, the protesters didn't appreciate his bureaucratic answers and inability to make any policy decision. Hsiao left under heavy police protection without accomplishing anything. The protesters successfully inconvenienced operation of the government for 20+ hours. At the press conference before the TRF called off the occupation, Professor Frida Tsai said the movement was only the beginning and promised more protests in the near future. The demands of the Taiwan Rural Front and their supporters are: 1) The government should apologize and compensate the victims of forced demolition in Dapu Borough and return their land to them; 2) Investigate the possible corruption of Miaoli County Commissioner Liu Cheng-hung (The group sued Liu and filed a complaint with the Special Prosecutor's office yesterday) and 3) Amend the Land Expropriation Act (土地徵收條例). The TRF protests are the most unpredictable and creative protests I have witnessed here in Taiwan - from the students pretending to be Chinese tourists, so they could approach the Executive Yuan, which is significant and says a lot to the current administration's attitude toward Chinese tourists verses students from its own country, to allowing law enforcement to think the protest would be one location instead of another. The administration still chooses to not address the issues at hand. Commissioner Liu went into hiding and refused to answer any question from the media. President Ma Ying-jeou said yesterday that the Miaoli County Government is the appropriate party to handle the current situation in Dapu, and the Miaoli County Government is indicting students and suing them for damage of public property and obstruction of justice. Minister of Interior, Lee Hung-yuan (李鴻源) complained about the occupation while asking the protesters if they would do the same thing to McDonald's. Lee also said there is nothing wrong with the Land Expropriation Act, and it shouldn't be amended. According to Lee, the executive of such Act is the problem. Lastly, lets not forget that the Dapu residents whose homes were destroyed and their land taken have yet to receive any compensation from the government and the justice their rightfully deserve. While there are many other cases in Taiwan deserving of attention and advocacy, the Dapu case will be an lingering issue until the government deals with it. The residents are living in rented apartments for the time being. While keeping pressure on the government on Dapu, the TRF is proposing a comprehensive plan to lobby for amendment to legislation, to change government taxing policies and to advocate for those who are ultimately affected by the government's land grabbing policies countrywide, for example, aborigines from Taitung's Red Leaf (紅葉) were invited and traveled six hours on train to attend the rally last Sunday to testify and protest the acquisition of their land to make a hot spring resort. I expect more discussions from the public, among politicians and lawmakers with additional moves from the TRF in the future. I doubt you will allow this comment through but I am going to write it anyway, because as much as I would like to applaud the TRF, I cannot. In my opinion, professor Hsu and his organization are wrong with respect to the third, and most important of their stated aims. The Land Theft Act should not be amended, it should be repealed. The ethical heart of the matter is a simple violation of property rights; stealing land from poor people (or rich people for that matter) does not suddenly become morally acceptable if it renders a "service to the community". That is a dangerously subjective standard - specifically, it is a standing threat to the freedom of individuals from the demands of the community, or of the professional monsters who manage to get themselves into community "leadership" positions. By arguing for the Act's amendment instead of its outright repeal, the TRF are not actually opposing the theft of people's properties. They are merely opposing the circumstantial aspects; the manner in which the theft was carried out and the purposes behind it. Much though the contrary impression might be given by their sit-ins, they are not actually fighting for an end to state-sanctioned theft per se. The debate over the future of the Land Expropriation Act, whether it's amendment, outright repeal, expansion or leaving it alone is a legitimate topic of discussion and needs to be encouraged, as many citizens' land are currently in the process of being acquired by the local government. The current administration's position is the Act has no problem in itself. It's the execution of the Act that is the problem. Members of the TRF and you are in agreement with quite a few issues you mentioned here. They are approaching the issue by demanding major revision of the Act, which might render the Act completely ineffective if the amendments were passed. That said, for now, both amending the Act or repealing the Act as you suggested, seem to be unlikely due to the composition of the Legislative Yuan. I appreciate you letting my comment through - and even replying too. However, your remarks don't answer my question. If as you say the TRF people are in agreement with me, why are they not pushing for repeal? I could understand it if they thought there was a better chance of getting the amendments passed than a repeal bill passed, and the choice was therefore tactical, but since as you say, the composition of the legislature precludes either then why are they opting for what an Australian might call the "softcock" version? I suspect there is a reason for this. I'm not a member of or am affiliated with TRF, so I can't speak on their behalf. My pessimism derived from my own observation on how the legislators and party caucus work in the Legislature. If the position of the majority party, in this case, the KMT is that the current version of LEA is fine, then regardless of how good of a lobbyist one is, members of the party would not support any amendment or repeal. From my understanding of TRF's position, they believe the government can try to acquire an individual's property for development; however, the process in which the government can achieve that should be very closely scrutinized. For example, there should be hearings held and all parties involved should have a chance to express their position and opinion. Compensation to those land is to be acquired should also be reasonable and relevant to the economy at the time of the acquisition. Both you and TRF held the position that the government simply cannot just opt to acquire an individual's property based solely on the government's own assessment that it is for "development" or "public interest" or because the majority of the other residents support such development. The disagreement, in my personal opinion, is politically ideological. "The disagreement, in my personal opinion, is politically ideological." Absolutely. There is a crucial distinction between a right and a permit. What the TRF are advocating is merely a less arbitrary system of permits, not property rights. I must apologize Ketty - I went out to walk the first two dogs and forgot something - I am remiss without the crucial complement to that last comment I made; the disagreement I appear to have with the TRF is ethically ideological. The TRF's insistence on retaining the Land Theft Act, albeit in amended form, indicates that they still support State-sanctioned theft; they just want it on their terms (specified in the proposed amendments) and not those of the KMT. Any claim the TRF may make to defending property rights is therefore fraudulent, and their public standing should be affected accordingly.